Two beta phases planned ahead of release. 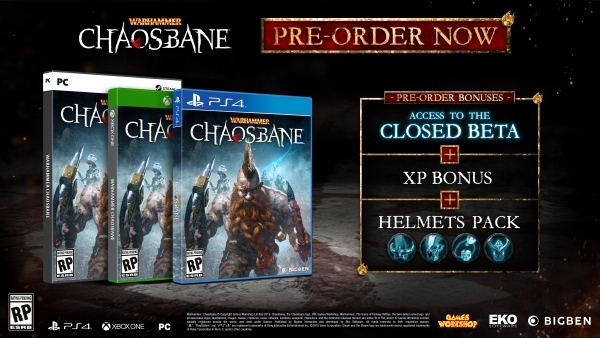 Warhammer: Chaosbane will launch for PlayStation 4, Xbox One, and PC on June 4, publisher Bigben Interactive and developer Eko Software announced. Pre-orders are available now on the Xbox Store, and will be available tomorrow on the PlayStation Store and at certain retailers. Two beta phases are planned—one in March and one in April. These will include access to the beginning of the campaign and the ability to test different classes in cooperative mode, and will only be accessible to players who pre-order the game. Pre-orders will also include an experience points bonus active for the entirety of the character’s progression, as well as a pack of four legendary helmets. In Warhammer: Chaosbane, each class offers the player distinct abilities and gameplay. As you cooperate, online or locally, with up to four players, cooperation and strategy will be essential to doing away with the hordes of Chaos. Unleash Bloodlust, a unique mechanic in Warhammer: Chaosbane, which lets loose a devastating power that can change the outcome of a battle.